The unit is insured for R900,000.00. However, the unit’s correct replacement cost is R1,400 000.00. There is a fire and the cost of damages and removal of debris is R650,000.00. Fire extinguishers and equipment, etc. 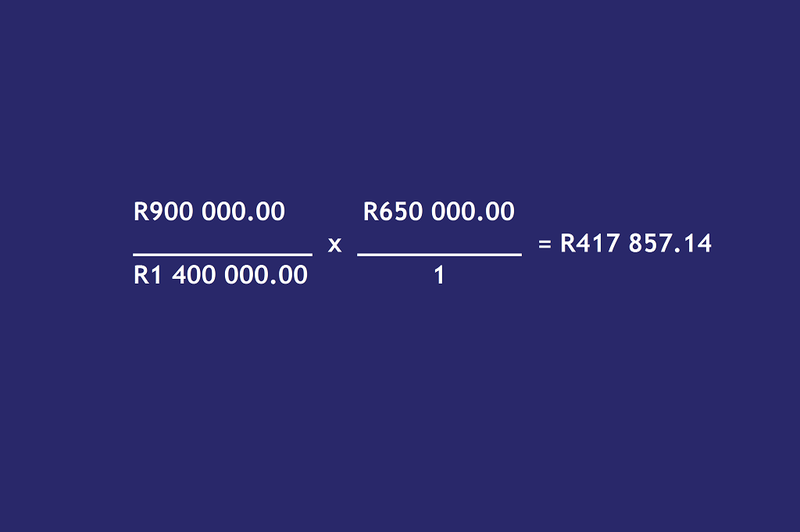 The settlement calculation will be as follows with the application of the Average clause: If the average clause is applied by the insurer, the total the insurer will settle for a loss of R650,000.00 will be R417,857.14. From the calculation, one can see why it is crucially important that the complex together with its common property is insured for the correct replacement value. Some insurers are providing limited cover for external fixtures and fittings. However, ALL Risk cover should be considered for any fixture or fitting located in the open that may potentially be subject to theft, attempted theft, malicious damage or vandalism. Insured values must be adjusted when additional items are added or improvements are made to the property or common property. For example: wooden flooring. carpets, pools, Jacuzzis, refurbishing of kitchens or bathrooms, addition of entertainment area, etc. Generally most policies give limited subsidence cover. However, this cover is excluded where there is active soils such as clay, dolomite and similar soil types that contract and expand due to the moisture content or water content of the soil. This means that there will be no cover for Subsidence and Landslip in these areas. The Body Corporate’s insurance does not cover contractors or loss or damage caused by them on site. It is strongly recommended that the Body Corporate only allow contractors with the correct Liability Cover to work at the property. It is further suggested that compliance in terms of OHS Act be taken seriously. The buildings should be properly maintained at all times to reduce risk of failing roofs, waterproofing, collapse of walling, the prevention loss or injury etc. Owners and Trustees have a responsibility to advise the insurer of any increased risk that would affect the underwriting or premium rate or cover itself. For example: Businesses being run from the unit, storing of flammable or explosive materials on site, section extension or renovations, etc. All structures must adhere to building regulations and standards, retaining walls are specifically excluded from cover. Proper signage and appropriate disclaimer boards should be prominently displayed at entrances and particularly around swimming pools, visitors parking, stairs, etc.